Send a special holiday greeting to your friends and family this year! These bi-fold cards are printed on matte stock with matching white envelopes and feature one-of-a-kind artwork and holiday quotes from Willa Cather. 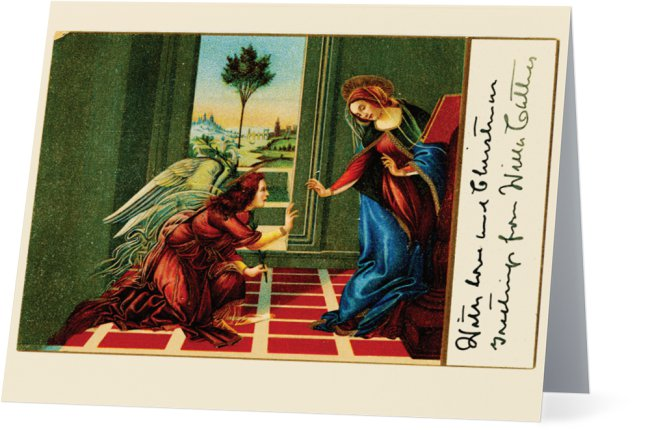 Front image: Botticelli's Cestello Annunciation, with handwritten greetings from Willa Cather. Reproduced from the Beatrix "Trix" Mizer Florance and Sidney R. Florance Collection at the National Willa Cather Center. Inside message: Wishing you a beautiful, blessed holiday season.